A useful compendium of strategies that bridge cultural diversity for competitive advantage. A University of Colo­rado pro­ject offering an encyclo­pedia around conflict reso­lution, in­clu­ding nume­rous essays, case studies, inter­views, and other infor­mation mate­rials. In Focus: The Le Pen of America? Marine Le Pen likely is the most prominent icon of a political surge that continues to gain momentum across much of the Western world. Having ousted the openly fascist founder –coinci­dentally, her own father–, she leads the French Front National, an ultra-conser­vative political party that made steady progress in recent elections. Some observers even give Le Pen a shot at the French presidency in 2017. Similar right-wing populist movements emerged elsewhere, such as the British UKIP, Germany’s AfD, Poland’s PIS, Hungary’s Fidesz, and several others. Their common denomi­nator is that they glorify the past and dismiss the present, reject diversity and tout nationalism as the answer to their countries’ maladies. Blaming migrants and globali­zation for their countries’ economic and societal worries, they promote harsh bans on both immi­gration and international trade as a cure-all that will pave the way into a bright future. Gearing up for this year’s race for the presi­dency, the United States have joined the trend. Donald Trump’s emergence as a leading candidate –at this time, THE leading candidate– of the Republican Party should not come as a surprise. The U.S. election system does not give much room for a third poli­tical party, so Trump’s decision to team up with the right-wing Tea Party was his best option as it allowed him to leverage that faction’s support across the Republican follower­ship. Is he the “Le Pen of America”? To be sure, their messages show plenty of simila­rities. Borrowing from Le Pen’s and others’ textbooks, Trump pledged to ban Muslim immi­gration and “build a wall to Mexico,” for example. Their respective promises to “make France / the U.S.A. great again” may be common across much of the political spectrum, but there are plenty more hints that Donald Trump and Marine Le Pen are singing from the same songbook. But they each do so in their own voice. It is inter­esting to compare The Donald’s style with Marine’s. To the outside observer, Candidate Trump seems to thrive on the number of perceived adver­saries he manages to insult – within his own party, across the aisle, and everywhere else in the world. Britain’s Prime Minister, David Cameron, called him “divisive, unhelpful and quite simply wrong” after Trump badmouthed British police tactics and commit­ment. The parlia­ment of the United Kingdom, low and behold the United States’ most loyal ally ever, later this month will discuss a petition aimed, on the grounds of an anti-“hate speech” law, at banning Trump from entering the country. Within a few weeks, that petition had received a whopping 570,000 signatures. Not one to tire easily, the candidate already managed to offend numerous other countries, drawing strong negative comments from top govern­ment represen­tatives of places such as France and Mexico, Iran and the United Arab Emirates. Even when he had a point, such in his refusal to refer to Jerusalem as the undivided capital of Israel, he managed to state it in ways that deeply offended that country, histori­cally another U.S. friendly. In contrast, Le Pen is cautious to avoid overly extreme statements, both on domestic and foreign issues. Her rhetoric aims at reaching concerned conser­vatives without alienating them. "Seriously,” she said in a recent TV interview when asked about Trump compa­risons, “have you ever heard me say something like that?" After all, she can afford to lose a few radicals by packaging her extreme messages with a tamer rhetoric delivery if that means reaching some of the moderates, too. Ok, so maybe Trump is no Le Pen, or maybe he is Le Pen without the chalk. Either way, The Donald appears to be his own worst enemy when it comes to alienating the rest of the world, friends and foes alike. It is impossible to see anything but damage to America –her business, her reputation, and the support she receives abroad– coming out of this man’s behaviors. Accordingly, anyone serious about inter­national business and colla­boration must share my hope that the U.S. primaries will reflect that conclusion, too. My real worries focus on a bigger aspect: I do not believe that all Donald Trump fans are right-wing extremists, no more than I believe that all Le Pen fans or the followers of any other idol of these “fearful conser­vatives” are. What makes the popu­lists popular is that they ask valid questions and give simple answers. Unfortunately, not everyone realizes that in our complex world of today, simple answers rarely, if ever, work. Across our countries, we need politi­cians who can give solid answers rather than merely raise questions, politi­cians who take the fears, even unwarranted ones, of these substan­tial population groups seriously and come up with strategies that work. This year and the following one give the people of many of the world’s leading economies a new chance to choose their leaders. Let’s try to get the ones that are up to the job. This article is also available in PDF format (requires Adobe Reader ). Please visit our new mobile-friendly website! This highly interactive online training includes individual self-paced learning and webinar-style exchanges of experience with the facilitator and others in the class. Check out our module preview to get an idea of how much fun online learning can be! Can be spread over as little as two days and as much as two weeks. Flexible schedules allow learners to get most of their normal work done. Online access from anywhere facilitates multi­cultural learning. 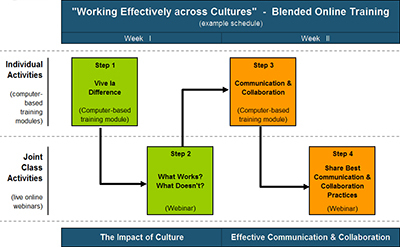 Webinars can leverage client’s normal environ­ment. Newsletter informs learners of next steps. Password-protected site provides self-paced modules, course information, and additional materials. Please contact us if you would like to know more about this innovative online training. 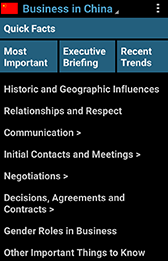 All 50 individual Country Sections from Negotiating International Business are available online for free. Download Country Section PDF files now. Lothar Katz is the founder of Leadership Crossroads. He has helped many clients achieve productive cooperation across cultures and drive business success on a global scale. A seasoned global executive, he regularly interacted with em­ployees, cus­tomers, out­sourcing partners, and third parties in numerous countries around the world. Ten Tips for Doing Business in The U.S.A.
Move faster in business than you may be used to. Most Americans firmly believe that 'time is money'. Communication can be very direct, especially in the northern and eastern U.S. Never take this personally. Get a legal briefing upfront. The U.S. is the most litigious society in the world and lawsuits can become very costly. Though some are tough negotiators, most people seek to reach win-win solutions and are willing to compromise. Decisions are usually made by individuals. It is vital to get direct access to the decision maker. get information, not necessarily to have the answers themselves. This is a "linear-active" culture. Most people prefer to follow checklists and dislike digressions or interruptions. "How are you?" is not an inquiry about your health. The best reply is "Fine, and you?" Titles matter little in this country. It is often better not to mention your academic degrees. Eye contact should be frequent as this conveys sincerity. Smile often and remain friendly overall. Our newsletter is a quarterly publication about all aspects of International and Cross-Cultural Business Management. The 1Q 2016 issue is on the web at www.leadershipcrossroads.com/news_0116.htm. Past issues can be found in our newsletter archive.